Maria Lozano-Jaramillo, a PhD student from Wageningen University, is joining Ethiopia’s African Chicken Genetics Gains (ACGG) team over the next two months to gather information to aid her research. In this post, she explains how her work aligns with the ACGG project and discusses her objectives for the trip. I am a biologist with a masters degree in biological sciences focusing on evolutionary biology and ecology from La Universidad de los Andes in Bogotá, Colombia. I have also worked as a teacher, and in research that focused on the effects of climate change on species distributions. What are the aims of this trip to Ethiopia? Currently I am a PhD student at Wageningen University, and for the project, I will work with ACGG. The research project is focused on Ethiopia. Therefore, I am visiting for two months to learn more about the country and the program, and to be more actively involved in it. I plan to start building a network in Ethiopia at the International Livestock Research Institute (ILRI) and the Ethiopian Institute of Agricultural Research (EIAR), among other organizations, that might bring fruitful insights to the project. I also plan to visit the Debre Zeit testing station to learn about their poultry management protocols, and last but not least, I would like to visit some smallholders farmers to learn about their practices. My research will focus on understanding how climatic variability can have an effect on poultry productivity in Ethiopia. As part of the ACGG program, my goal is to propose a methodology that manages to include this climatic variability when setting up breeding programs. I think this project matters because it can offer the possibility to explore an approach that is important to take into account in areas where the climatic variability is high. 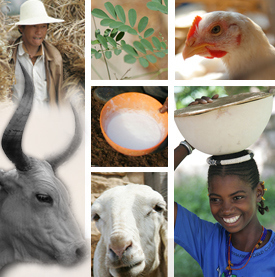 The ACGG program has shown significant progress in improving the Horro breed, for example; this suggests that by refining chicken breeds, and making them more productive, and at the same time resistant to the local conditions, the project can have an impact on improving smallholders livelihoods by enhancing not only their nutrition, but also aiding in poverty reduction. This is what gets me excited, having the opportunity to help others and having a positive impact on their lives and their future. When a project involves many actors and is as large-scale as this one there are always concerns. However, instead of focusing on the concerns, I try to focus on my work and how my work can be developed without affecting the rest of the team. If I can be of help for others for the project to succeed, I offer to help. There might be many factors that are not in my control, so if anything changes I will focus on finding solutions instead of being fixated on the problems. I expect that we can help the smallholders in several ways. I hope the methodology we design can be used to generate breeding programs that will target the specific needs of the smallholders depending on their production system. This way we can help them improve their livelihoods by enhancing economic benefits and nutrition. The role of women in poultry farming is also important and empowering women is a key goal of the project. I hope the role of female farmers can be ensured and maintained not only throughput the project but in a longer-term. It is a privilege to be part of ACGG. I know that it is an ambitious initiative, but it has all the appropriate tools to be successful and ensure an important and positive outcome on poultry farmers across the countries. To learn more about animal breeding and genetics at Wageningen University, click here. Tags: Maria Lozano-Jaramillo, voices. Bookmark the permalink.